Ruba Emran was assigned the task of exploring what she calls a “science fiction idea”—one that’s been around for a while, but whose time, so far as practical application, has not yet come. 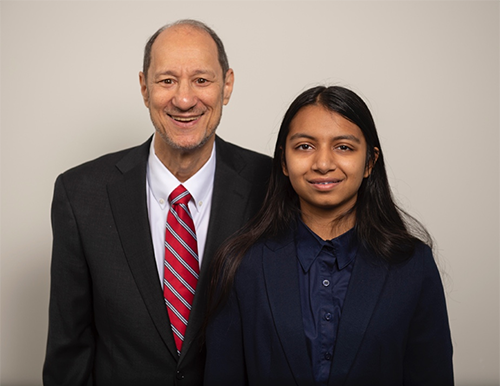 A rising sophomore at Thomas Jefferson High School in Alexandria, Va., Emran signed up for a summer with MITRE’s Emerging Technologies Summer Student R&D Program. Taking her place as one of 26 students working under the supervision of 24 mentors, Emran drew the task of investigating the engineering of a space elevator. That’s a proposed type of planet-to-space transportation system that would ride on a cable anchored to the Earth’s surface and extend into space, in hopes of making such Earth-to-orbit transportation much more economical. Ruba’s science-fiction-like problem: What kind of cable should she design? What kind of material would be strong enough to support the enormous mass of a 24,000-mile cable and loads traveling from Earth to space and back? She turned for advice to her MITRE mentor, James Ellenbogen, who suggested that a look at how rope and yarn are made might offer lessons for the space elevator cable. And, in Emran’s mind, science fiction seemed a bit more plausible. “It gives you an idea of how much technology can do and advance to make some really crazy ideas come true—and how my skills, in particular, can help with some projects that I would have thought were impossible,” Emran says. A quarter century after it began, the corporate goal of fostering more forward-looking ideas, like the one Emran is developing, drove the Emerging Technologies program to expand substantially this past summer. 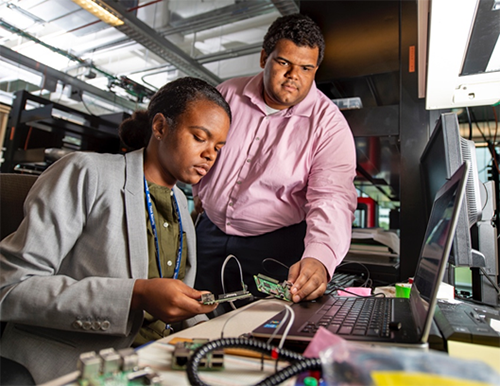 For example, when the student investigators with the 2018 Emerging Technologies program presented their findings on Aug. 9, they did so in two rooms rather than one and covered two different research tracks. That’s because the program nearly doubled in size—from 14 students in 2017 to 26 this year. It was also more diverse ethnically and gender-wise. Plus, 16 young high school students (like Emran) took part, while there were only two last year. And the investigations covered a more diverse range of disciplines of growing interest to MITRE’s sponsors. The Emerging Technologies program is now a major undertaking for MITRE. It draws upon contributions from staff at all levels of the company, including many who were not mentors or student investigators. For example, Human Resources expedited the hiring process and ensuring 2018 investigators would be a diverse lot, while the corporate lab directors and facilities staff went the extra mile to find and outfit the large amount of space required for a 26-student R&D program. In its early years, the Emerging Technologies program did include many high school students. But, responding to evolving project and laboratory requirements, until this past summer the age of the student researchers had gradually inched upward. Over the years, the program also has come to feature more non-traditional students—those in their twenties who returned to school to finish their degrees and learn new skills. There were two such students in last year’s program. In addition, the nature of the research has broadened: The Emerging Technologies program cuts across areas like healthcare, information security, robotics, physical and life sciences, and space sciences. The program has certainly helped Michele Horner sharpen her focus on the kind of work she eventually wants to do. A rising sophomore at the University of Virginia, Horner returned to MITRE for her third summer, investigating ways to improve tracking of objects that orbit Earth. At one point several years ago, Horner was planning to major in biology and medicine, but then switched to astronomy. And this summer, partly as a result of her prior experience at MITRE, she switched the focus of her research as well, working with MITRE mentors to write an algorithm to track satellites using different types of sensors. It was a turning point. 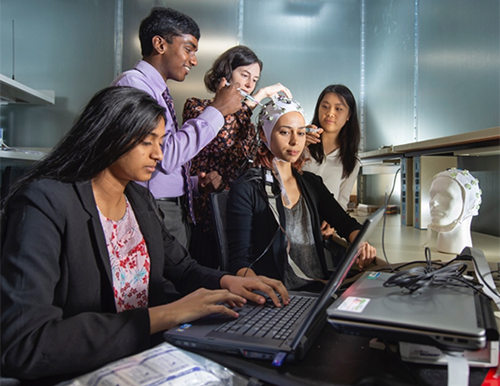 Such guidance, aimed at helping train the next generation of scientists and engineers, has always been one of the Emerging Technology program’s main goals. Now, with MITRE’s support, the program is helping students see a wider range of possibilities for how they may one day apply their talents. They, and their MITRE mentors, will continue to learn a lot from one another. “I’ve always seen our program as a way of looking into potentially useful ideas that might not otherwise be explored, or at least not with quite the same MITRE nuance,” Ellenbogen says. “Also, there are very talented adults involved in these explorations, so there’s a lot of development of the adult staff, too. As examples of this, Ellenbogen points to two staff members, Jennifer Lombardo and Nick Serger of the Emerging Technologies department, who participated as college students in the Emerging Technologies summer program in 2016 and 2017, then joined the company as full-time staff this past winter. This past summer, they served as co-leaders of the entire expanded summer program and gained their first managerial experience, while they each mentored a high school student in a research task, as well. But now, she’s looking into changing that. Russell Woolard writes for MITRE’s Strategic Communications department. © 2018 The MITRE Corporation. All rights reserved. Approved for public release. Distribution unlimited. Case number 18-3434.